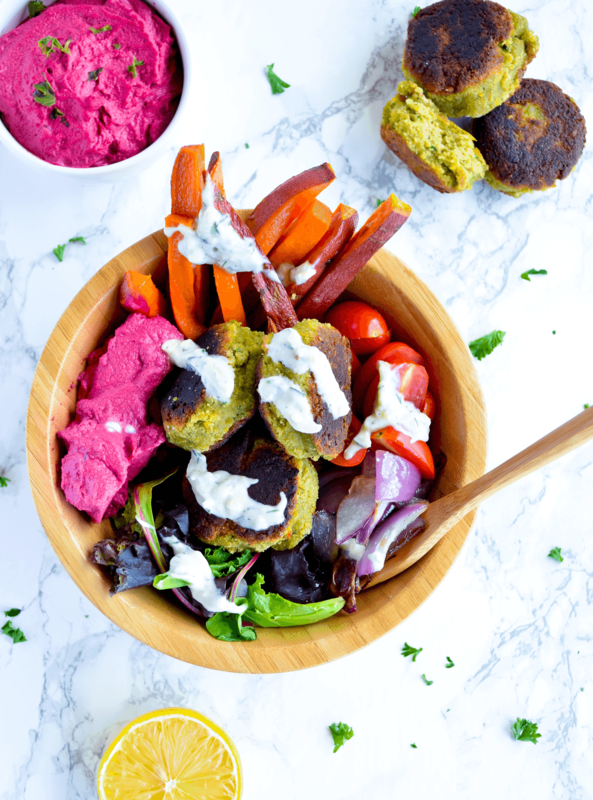 Falafel buddha bowls with maple glazed sweet potato fries, roasted onions, garden veggies, beet hummus, and drizzled with a tangy vegan tzatziki! These Mediterranean buddha bowls are super nutritious and packed with flavor. If you’re new to the buddha bowl craze, then let me introduce you! Buddha bowls are filling meals that usually have greens, veggies, beans or legumes, healthy grains or seeds, and of course, a delicious sauce or dressing. I left the grains out on this one since the chickpeas in the beet hummus and kale falafel already provide plenty of fiber and protein, but feel free to add your own! Here’s a little buddha bowl secret. They absolutely taste better out of bamboo bowls or some cute coconut husk bowls. It’s science (okay maybe not, but just trust me on this one). Something just feels so right about eating these fresh plant-based meals out of a plant-based bowl! One of the greatest things about buddha bowls is that they’re super customizable, so if you don’t like one of the ingredients you can always sub it out for something else. Preheat oven to 425 degrees. Wash and dry the fresh produce. Cut sweet potatoes into 1/2-inch thick fries. Halve and peel onion, then cut into 1/2-inch thick wedges. Halve tomatoes lengthwise. Toss the sweet potato fries with a drizzle of olive oil, the maple syrup, and a pinch of salt and pepper on a baking sheet. Bake for 15 minutes. After 15 minutes flip the fries and add the onion wedges, a drizzle of olive oil, and salt and pepper to the baking sheet with the fries. Continue to roast the fries and onion wedges for another 10 minutes until they are tender and browned. When the onions and sweet potatoes have finished roasting, split the greens, tomatoes, sweet potato fries, onion wedges and hummus between two bowls. Add 3-4 falafels to each bowl and drizzle with tzatziki sauce. Buddha bowls definitely make for Instagram worthy pics, but this falafel bowl is every bit as delicious as it is beautiful! The sweetness of the maple sweet potato fries pairs perfectly with the savory and flavorful falafel. The fresh veggies and this tangy vegan tzatziki ties it all together! If you want to add some grains to your buddha bowl while keeping that Mediterranean inspired flavor then try adding this budget friendly quinoa tabbouleh (recipe from BudgetBytes.com). It’s simple, fresh, and delicious! A Mediterranean inspired buddha bowl with kale falafels, maple glazed sweet potato fries, roasted red onion, garden veggies, and beet hummus. All drizzled with a vegan tzatziki sauce. Preheat oven to 425. Wash and dry fresh produce. Cut sweet potato into fries, peel and chop onion into wedges. Halve tomatoes lengthwise. Toss sweet potatoes with a drizzle of olive oil, a pinch of salt and pepper, and the maple syrup on a baking sheet. Roast in oven until tender and brown, about 25 minutes. After sweet potatoes have been in oven for 15 minutes, remove baking sheet, flip the fries, and add onion wedges to sheet with a drizzle of olive oil and pinch of salt and pepper. Continue roasting for another 10 minutes. Once onions and sweet potatoes are done, split the greens, tomatoes, sweet potato fries, onion wedges and hummus between two bowls. Add falafels on top and drizzle with tzatziki sauce. If you use the falafel, hummus, and tzatziki recipes I recommend above then this recipe is both vegan and gluten-free!